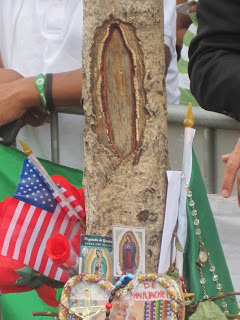 WEST NEW YORK, N.J. "People are flocking to a tree in northern New Jersey where some say they see the image of the Virgin Mary. Makeshift shrines have sprung up by the tree. People have been praying, crying and leaving flowers and candles as they look at the small opening where the bark was stripped away.